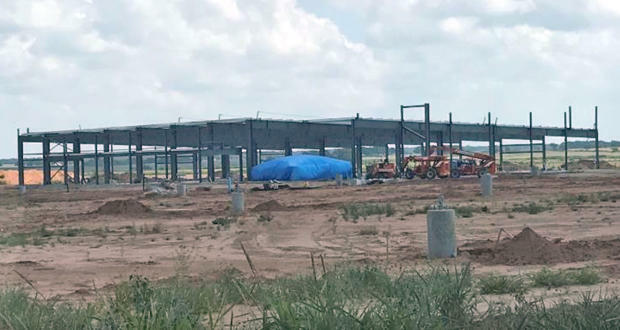 Construction of a Chickasaw Nation casino in Terral. Leaders of some Oklahoma tribes see opportunities in a court ruling this summer that could potentially open up many questions about sovereignty and jurisdiction on tribal lands. The three judge panel on the 10th Circuit Court of Appeals ruled on August 8 that Congress never disestablished the Creek reservation and, by extension, other reservations in Oklahoma. The 126-page Murphy v Royal decision found Patrick Dwayne Murphy should not have been tried by the state of Oklahoma, but instead in federal court. Murphy, who is Native American, is accused of killing another Native American man in Indian Country. At this week’s meeting of the Native American Finance Officers Association Conference held in Tulsa, tribal leaders were still trying to figure out what happens next. Muscogee (Creek) Nation Principal Chief James R. Floyd said the Inter-Tribal Council of the Five Civilized Tribes says they are working to uphold the ruling, while at the same time trying to not interfere with taxation and law enforcement that’s already in place. In addition to the Muscogee (Creek), the other members are the Cherokee, Chickasaw, Choctaw and Seminole. If the ruling is upheld, it could have broad implications for the state and the tribes. “It would give back the tribes the power over their lands. They would get the sales taxes collected. They would be overseeing child care and education. They would ultimately be the ruling bodies,” Fleming told KGOU. If the reservations were never disestablished, then the tribes would need to go through a different process to acquire land, according to a lawsuit filed by the Comanche Nation. They have brought suit against the U.S. Department of the Interior over plans by the Chickasaw Nation to construct a new casino in Terral, a small town near the Texas border. “According to the lawsuit, this should have been an off-reservation-type acquisition because the Chickasaws have a reservation, or at least that’s what the Murphy decision said. The Comanches argue the land wasn’t acquired legally, so the casino’s construction needs to stop,” Fleming said. Jacob McCleland: This is the Business Intelligence Report, a weekly conversation about business news in Oklahoma. I'm Jacob McCleland, and I’m talking today with Journal Record reporter Molly Fleming. Molly, what’s up? Molly Fleming: Oh, just a lot of tribal coverage this week. McCleland: Well great, I’m so glad that you want to talk about tribal coverage because that’s what I have in mind as well today, especially a legal decision from a three-judge panel of the 10th Circuit Court of Appeals this summer. This is the Murphy vs Royal case, which overturned a murder conviction because it took place on Muscogee (Creek) land. Both the accused and the victim are Native American. And the ruling found Congress never abolished the Creek reservation. The decision is now being appealed. But if it is upheld, it could have major consequences for Oklahoma. What does this mean for legal jurisdiction for the state of Oklahoma in tribal lands? Fleming: Well, it could mean that the state has no jurisdiction over those lands. It could mean that the tribe would be the one to collect sales taxes and be the governing body. But from the attorneys I’ve spoken to about this, they don’t think that will happen because of the land has lost it Indian character, which is an important term there. Supreme Court Justice Ruth Bader Ginsburg referenced this in 2005 Supreme decision in the City of Sherrill, New York v. Oneida Indian Nation of New York. She said the tribe could not just revive its ancient sovereignty of land in question because it had lost its Indian character. McCleland: So the state of Oklahoma is appealing this Murphy decision. What is the state arguing here? He also said there was a point in the late 19th century where neither federal nor Indian courts had jurisdiction, so surely Congress had intended state jurisdiction. He sent a letter to all the tribal leaders saying that while he doesn’t want to damage the relationship with the tribes and the state, he does have to show that Oklahoma is a unified, synergistic, and one cohesive politic. McCleland: This obviously could potentially have ramifications for the Muscogee (Creek). Are there other Oklahoma tribes who fall under similar circumstances … that Congress didn’t dissolve their reservations, too? Fleming: So the term is disestablish, and yeah, this applies to the tribes across the state. There was a pretty extensive decision on this. 126 pages that really went through the history of this and said that, you know, the phrase “it takes an act of Congress,” and in this case there was no act of Congress to disestablish them. McCleland: You wrote this week that tribal leaders see opportunities in the ruling. Tell us a little about that. What types of opportunities do the tribes see, if this decision is upheld? Fleming: It would give back the tribes the power over their lands. They would get the sales taxes collected. They would be overseeing child care and education. They would ultimately be the ruling bodies. But I really think they’re trying to sort through all of that. They talked about this on Monday at the Native American Finance Officers Association Conference held in Tulsa, that they don’t want to mess up anything that’s already been established. So they’re really trying to sort this all out with the state, even with the appeal going on. McCleland: Molly, what are the potential implications for casinos or other businesses that operate on tribal lands? Fleming: Yeah, so that’s where this could get sticky. If the reservations were never disestablished, then the tribes have to go through a different process for how they get their land, or at least that’s the argument in a lawsuit the Comanche Nation has filed against the United States Department of the Interior and related parties. The Chickasaw Nation has acquired land for a new casino near Terral, and it’s under construction. Terral is in south Oklahoma. According to the lawsuit, this should have been an off-reservation-type acquisition because the Chickasaws have a reservation, or at least that’s what the Murphy decision said. The Comanches argue the land wasn’t acquired legally, so the casino’s construction needs to stop. McCleland: KGOU and the Journal Record collaborate each week on the Business Intelligence Report. You can find this conversation at kgou.org. You can also follow us on social media. We're on Facebook and Twitter, @journalrecord and @kgounews.